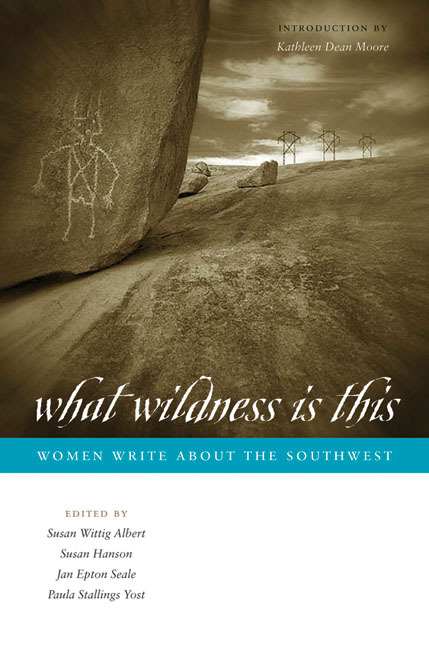 A collection of writings by emerging and well-known writers, including Joy Harjo, Denise Chávez, Diane Ackerman, Naomi Shihab Nye, Leslie Marmon Silko, Gloria Anzaldua, Terry Tempest Williams, and Barbara Kingsolver, that explores women’s experiences in the natural world of the Southwest. How do women experience the vast, arid, rugged land of the American Southwest? The Story Circle Network, a national organization dedicated to helping women write about their lives, posed this question, and nearly three hundred women responded with original pieces of writing that told true and meaningful stories of their personal experiences of the land. From this deep reservoir of writing—as well as from previously published work by writers including Joy Harjo, Denise Chávez, Diane Ackerman, Naomi Shihab Nye, Leslie Marmon Silko, Gloria Anzaldua, Terry Tempest Williams, and Barbara Kingsolver—the editors of this book have drawn nearly a hundred pieces that witness both to the ever-changing, ever-mysterious life of the natural world and to the vivid, creative, evolving lives of women interacting with it. From the Gulf Coast of Texas to the Pacific Coast of California, and from the southern borderlands to the Great Plains and the Rocky Mountains, these intimate portraits of women's lives on the land powerfully demonstrate that nature writing is no longer the exclusive domain of men, that women bring unique and transformative perspectives to this genre. Susan Wittig Albert is the founder and past president of the Story Circle Network. She lives near Austin, Texas. Susan Hanson teaches in the English Department at Texas State University-San Marcos. Jan Epton Seale is a poet and fiction writer in McAllen, Texas. Paula Stallings Yost, founder of LifeSketches/Heirloom Memoirs, is a personal historian and publisher in Yantis, Texas, near Dallas. Eagerly, I pulled anthologies off my shelves, looking for more women, more deserts, more of these mornings. They were hard to find. Most of the essays in my nature writing anthologies celebrated green valleys, frog-graced marshlands, or frozen white mountaintops, not the sere truth of the desert. Except in the most recent anthologies ( Getting Over the Color Green , for example) almost all the writers were men, and of those, most were Euro-American. I realized that much of the work of the women who write in the harsh shadows of the Southwest remained scattered across sand and time and distance—work overflowing the shelves in libraries, museum shops, and used book stores, piled in stacks on the bedside tables of friends, tucked into a letter, or mailed from a distant, sun-scorched town. The truest art I would strive for in any work would be to give the page the same qualities as earth: weather would land on it harshly, light would elucidate the most difficult truths; wind would sweep away obtuse padding. Finally, the lessons of impermanence taught me this: loss constitutes an odd kind of fullness; despair empties out into an unquenchable appetite for life. This collection is a celebration both of the natural world and of personal story. It gathers together women's writing about their experiences in the natural world of the Southwest, from the Gulf coast of Texas to the Pacific coast of California, from the southern borderlands into the southern Great Plains and southern Rockies. Taken as a whole, these pieces demonstrate and illuminate not only the rich diversity of landscapes of the Southwest, but the extraordinary range of women's voices and women's experiences of the land as well. As editors working with both unpublished submissions and already published work, we were looking for writers who have experienced the natural world, not as Nature, objectively, artifactually "out there," but in a deeply personal, intimate, and self-revealing way, "in here": as forms of the interior life discovered in the wild, wonderful world of landforms and life forms around us. We set ourselves the task of finding pieces of writing—prose, poetry, creative nonfiction, and memoir—that witnessed both to the ever-changing, ever-mysterious life of the natural world and to the vivid, creative, evolving life of the writer herself. We were especially looking for writing that testified in some significant way to the topography of place and of spirit, that explored the congruence of where we are and who we are. We hoped (although perhaps we weren't as confident as we pretended to be) to find writing that celebrated women's bodies, senses, memories, identities, and spiritual selves within the context of place: plains and mountains, deserts and canyons, farm fields and forests, empty wilderness and the wildness of urban nature. We were not looking for writing that was merely decorative (substance was more important to us than style), or stories with happy endings. We expected to find—and we did—stories of loss and rejection, of pain and despair, of anger at justice denied and rage at humankind's uncaring exploitation of the land. But we also hoped to find writing that suggested how imagination and spirit intersects with the experience of nature in transforming and redeeming ways, and what potential these experiences and transformations might hold for all of us. We succeeded beyond our most optimistic imaginings. Our invitation (extended through mailings and e-mailings to women's writers' groups, programs, newsletters, and magazines, as well as through our Web site: http://www.storycircle.org/WomenWrite/) resulted in nearly three hundred submissions of unpublished work—some four hundred fifty individual pieces of writing. The authors did not have to be residents of southwestern states or members of the Story Circle Network, the organization that sponsored the book; the only requirement was that they tell a true and meaningful story based on their own personal experience of the land. The editors lived hundreds of miles from one another—in East Texas, the northern Hill Country, the southern Hill Country, and the Rio Grande Valley—so it was impossible for us to meet regularly. Instead, we worked via e-mail and the Internet, reading the writings posted to an editorial Web site by our talented and dedicated assistant, Peggy Moody, without whom this kind of communication would not have been possible. For months, the four of us read, discussed, and considered all the submissions, gradually narrowing the possibilities, until we felt we had chosen the best—some fifty pieces, nearly fifty thousand words (or the equivalent) of prose and poetry. As we worked, we tried to be attentive to the possible organizations that seemed to grow out of what we were reading. When we finished, we saw that the work seemed naturally to arrange itself into eight different sections: the way we live on the land; our journeys through the land; nature in cities; nature at risk; nature that sustains us; our memories of the land; our kinship with the animal world; and what we leave on the land when we are gone. Then we tackled the other half of the job: selecting already published work to complement and extend the unpublished pieces that had been sent to us. Gathering up every bibliography we could find, we made lists of authors, books, and journals in which we might discover the sort of women's writing we were looking for: not just "nature writing," but writing through which the writer revealed essential parts of herself, describing the transformations brought about by her experience in the natural world. Eventually, we would choose an additional fifty-some published pieces. We played with these selections via e-mail, sorting through dozens of possible placements and organizations, until we came up with the arrangement in the Table of Contents. This book has been a long journey, but never a lonely one. As editors, the four of us were separated by distance but as close as our computers. And we were never alone, for our journey has been accompanied by the voices of hundreds of women, singing their lives, singing their stories, singing the land. And then there has been the land itself, described in the hundreds of pieces we have read: the land of wide skies and high mountains and vast deserts and open plains. Barry Lopez has said that, as a people, contemporary Americans have learned the potentially disastrous trick of ignoring our local geographies. We eat imported food, wear clothing constructed on the other side of the globe, fly across the continent without setting foot on the earth, and light up the night sky as if it were day. Not knowing the land itself—its geology, topography, climate, flora, and fauna—we find it only too easy to romanticize it, exploit its resources, and market it as a backdrop for entertaining adventures. But when the land becomes known to us through our ability to observe, to taste and smell and touch and hear and feel, it becomes real to us, in all its complexities and contradictions. The women's writings contained in this book reassure us that it is still possible to know the land, deeply and intimately, if we make that our purpose: to experience the land in the same way that we experience our bodies, our minds, our spirits. These stories of transforming encounters with the natural environments of the Southwest suggest that we can still have a profound connection with the earth and that our engagement with it can change our lives. We can still find ourselves at home in the world.